There's nothing like homemade ice cream and the members of the Minburn United Methodist Church have been serving it up for generations! The making of the ice cream is a multi-generational event with the recipe being handed down for decades. The annual Ice Cream Social is currently held in Meek Park prior to a Meet Me in Minburn concert and includes a meal of beef burgers and all the trimmings. 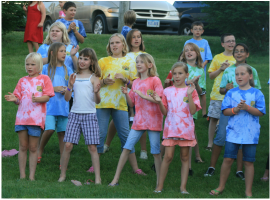 Every June the children of the Minburn community join their friends from churches in Adel & DeSoto for the annual ADM Ecumenical Vacation Bible School. Adults and teens from the churches plan, coordinate and volunteer their time in a variety of roles during the week long event. The theme changes each year including a mission project to benefit an area or world-wide program and the kids have TONS of fun! Each fall community members gather on an October day to enjoy fellowship and some of the best chicken & noodles you'll ever have! Over 100 meals are served along with take-out meals, many which go to our area farmers who are often in the height of harvest. A few years ago the men of the church began to pitch in more and took a primary role in the making of the meal. Funds raised from this event support church programs throughout the year. Supporting our community is vital to our mission. Each Christmas the church adopts a family and hangs mittens on a small tree. Each mitten has an item needed by the family. Members select mittens, purchasing and wrapping the gifts. We are proud and humbled to help those in need within our community.